The effects of global warming are heavily felt in Turkey and the latest victim of this global climate change is Lake Van. Being Turkey's biggest lake, Lake Van is one of the most important natural factors of the people living in the region. While some locals go fishing on the lake and make their livelihoods, some manage beaches and holiday resorts on its shores - boosting tourism. However, it seems like the increasing temperature of the lake's waters might end the heyday of the mighty Lake Van. 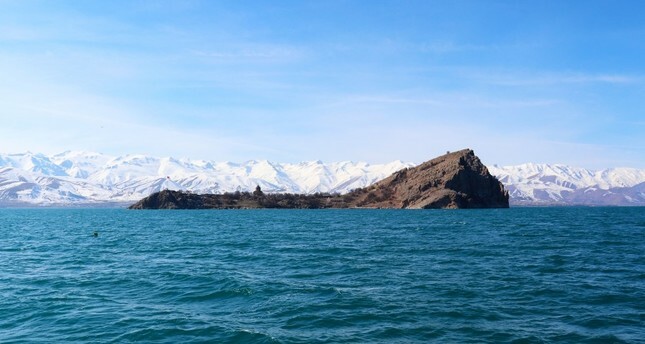 Associate professor Mustafa Akkuş of Van Yüzüncü Yıl University warned that the temperature of Lake Van's waters has been increasing in the last decade and it doesn't look like it will stop. Akkuş said he observed an increase of 2.4 degrees Celsius in the lake since the beginning of the 2000s and he added that 2017 has been the warmest year for Van in the last 20 years. The temperature increase in Lake Van is being caused by the lack of rain and snow fall in the recent years. Akkuş said the lake has to be less than 4 degrees Celsius for marine life to be able to "breath," however; currently the lake's waters are 7.8 degrees Celsius, which causes a lack of oxygen. "The effects of the temperature rise in Lake Van will be apparent in the summer months. Fishermen will have a hard time finding fish and the farmers who use the lake to water their farms will cause water levels to drop further," he added. About 14,000 people in the region earn their living by fishing for pearl mullet, which is the most common fish in Lake Van. However, if the temperature increase continues, Akkuş says that it is clear that it could affect the whole ecosystem and the fisheries that rely on it could suffer.